Cresols Market size was over USD 340 million in 2015, and is anticipated to grow at over 3% CAGR. Global cresols market size is primarily driven by escalating vitamin E demand in dietary supplements and food & beverages fortification. Changing consumer lifestyle and food habits along with fluctuating food nutrition content due to adulteration is the major driving factor for these dietary supplements. Meat consumption demand is directly proportional to the animal feed and animal feed additives such as vitamin E. In addition, global synthetic vitamin E consumption was more than 100 kilo tons in 2015 and must exceed 150 kilo tons by 2024, with an estimated gain more than 4% CAGR over the forecast timeframe. Furthermore, increasing nutraceuticals demand, particularly in Europe and Asia Pacific owing to increasing consumer awareness towards enhanced nutrient consumption will further complement industry growth. Butylated hydroxytoluene (BHT), is a lipophilic organic compound and is a chemical derivative of phenol, which is useful for its antioxidant properties. BHT stabilizes fats and is used to retain aroma, color and food items flavor. It is used as a major antioxidant in cereals, gum, fast food, processed potatoes, drink mixes and snack foods. Also, the compound is found in food packaging, animal feed, cosmetics, pharmaceuticals, rubber and plastics. Meta-cresols are produced with co-production of BHT. The FDA considers BHT as Generally Recognized As Safe (GRAS) for usage as a food additive up to 0.02% concentration. High dose of this ingredient may cause significant damage to liver, kidneys and lungs. Oral consumption has also shown to have toxic effects on the blood coagulation system in the body. In addition, Japan, Romania, Sweden and Australia have forbidden the product use as food additive. Thus, increasing BHT criticism, a workhorse antioxidant based on p-cresol, regarding its consumption may hamper cresols market size over the forecast timeframe. However, some notable cresols market share is used in industrial applications such as automotive, electrical & electronics industries owing to its ability to withstand escalated temperature under mechanical load with minimum deformation and or creep. This has created new growth openings by making the product desirable in automotive applications such as natural gas valves, brake pistons and pulleys. Meta-cresols market size was valued at over USD 160 million in 2015. The product is used as a precursor of synthetic vitamin E. Inclining vitamin E demand on account of improved consumer eating habits will drive industry growth for the product. In addition, increasing meat consumption has driven animal feed and feed additives demand, which consequently will complement industry growth. Para-cresols market share in analyzed to experience gains exceeding 3% over the forecast timeframe. It is primarily employed in the production of antioxidants such as BHT. Also, it is principally used in products such as cosmetics, pharmaceuticals, rubber and electrical transformer oil owing to boost industry share. Solvent was valued at over USD 35 million in 2015. Meta-cresol is mainly used in dissolving polymers such as polyaniline. Growing polymers industry for its use in industrial application will ultimately drive cresols market size over the forecast timeframe. Global cresols market size for chemical intermediates will witness highest gains more than 3.5% over the forecast timeframe. Cresols are mainly used as chemical intermediates in vitamin E production. Rising vitamin E consumption and its broad application array from human nutritional supplements, animal feed additives to antioxidant for polymers will drive industry growth. Furthermore, robust growth in chemical industries will further complement industry share by 2024. North America, led by the U.S. cresol market size was valued more than USD 45 million in 2015. Growing pharmaceutical sector will drive the industry growth for chemical intermediates by 2024. In addition, the region has significant packed food demand, which will further complement growth for preservatives. Asia Pacific must witness highest growth of over 3.5%. The regional cresols market share will be driven mainly by improving consumer food habits. 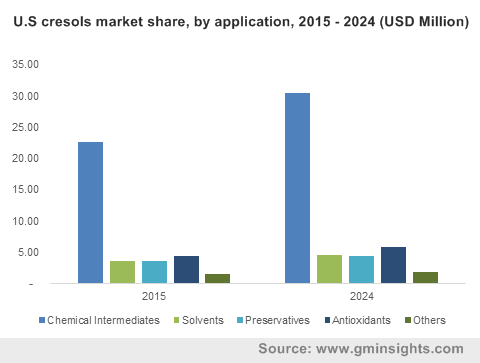 Global cresol market share is consolidated with five major industry participants including Sasol Phenolics, Lanxess AG, SABIC Innovative Plastics, Atul Ltd, and Henan Hongye Technological Chemical accounted over half of global share in 2015. Other prominent industry share contributors are Dakota Gasification Company, Asahi Kasei Chemicals and Rutgers Chemicals GmbH. The product can be obtained through natural or synthetic sources. Companies such as SABIC Innovative Plastics and Lanxess AG, extract it from natural sources such as crude oil, creosote, and cresolene through coal gasification and coking of coal tar. Additionally, Atul Ltd and Rutgers Chemical Gmbh procure raw materials such as cresylic acid from Sasol Phenolics and SABIC Innovative Plastics for the production of cresols through the synthetic process. Increasing vitamin E demand owing to its extensive application in dietary supplements and animal feed additives will fuel cresols market size over the forecast timeframe. However, the product is strictly directed from the EPA as they are destructive air pollutants, this may be a restraining factor for the cresols market share in the near future. It can also be obtained through synthetic processes such as toluenesulfonates alkali fusion, alkaline chlorotoluene hydrolysis, cymene hydroperoxide splitting and phenol methylation in the vapor phase. Furthermore, these are aromatic organic compounds which are widely used as chemical intermediates in the production of Vitamin E, polymer resins, antioxidants, plasticizers, solvents, pharmaceuticals, rubbers, dyes, fragrances and other chemicals.